It demands a higher price, gets cheese lovers in a spin and is talked about like fine wine. But what makes this king of cheeses different to the run of the mill blocks in the supermarket? Get the low-down with our guide to the West Country’s pride and joy. Cheddar has become the go-to cheese for most home cooks in the UK. Grated over dishes, stirred into sauces, melted over burgers – it’s so versatile and universally loved that it accounts for almost eighty percent of cheese sales in the UK. It’s no wonder most supermarket cheese aisles are lined with blocks of the stuff. But not all cheddars are created equal. You can usually find a 500g block of branded Cheddar on offer for less than £3, whereas a 200g wedge of another variety from the cheesemongers could cost twice the amount. They’re both technically cheddars, but the way they’re made and matured can vary massively. Invariably, the most expensive cheddars are labelled ‘West Country Farmhouse Cheddar’, a PDO-protected name that requires producers to adhere to strict standards and regulations. As a rule, the cheaper, industrially-made blocks are churned out in a factory, whereas West Country Farmhouse Cheddars are made by hand in much smaller batches and with higher quality ingredients. 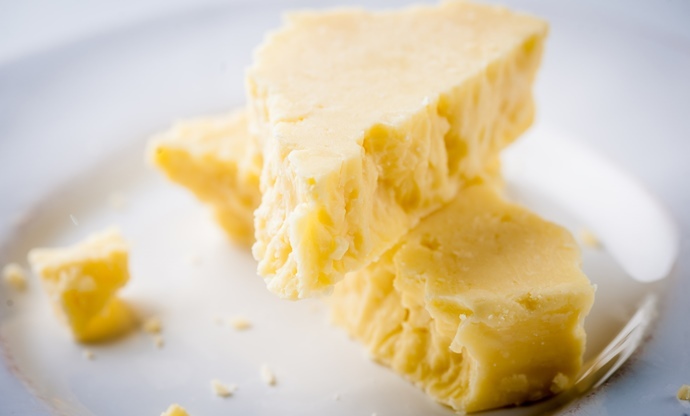 To become a West Country Farmhouse Cheddar, a cheese needs to meet certain criteria. Of course, it needs to be made in the West Country – specifically Devon, Dorset, Somerset or Cornwall – and the milk must come from these places too. It cannot contain any colours, flavours or preservatives, must be handmade and matured on the same farm it was created on for at least nine months. There are only around twelve West Country Farmhouse Cheddar producers, working hard to make the world’s entire supply of this special cheese. Some, such as Keen’s and Montgomery’s, buy milk from local herds, whereas others such as Westcombe use their own cattle and control the entire process from start to finish. But it’s the expert cheesemakers that really make the difference by touching, tasting and smelling the truckles that are wrapped in cloth and then greased with lard to help encourage the rind to form. 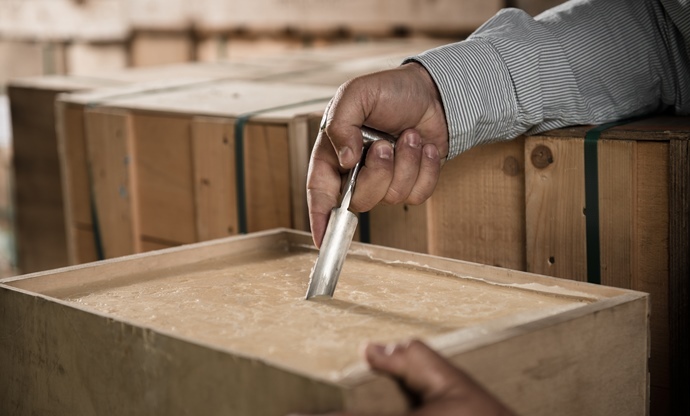 For the nine months after the cheese is created, these experts will use their in-depth knowledge to monitor the cheeses as they age in storerooms, barns or even caves. The way the milk is turned into curds must also follow a strict procedure. ‘Cheddaring’ – the unique way the curds are cut, stacked and turned, named after the village of Cheddar in Somerset – must be done by hand, and everything else must adhere to traditional methods, meaning a lot of modern machinery can’t be used. 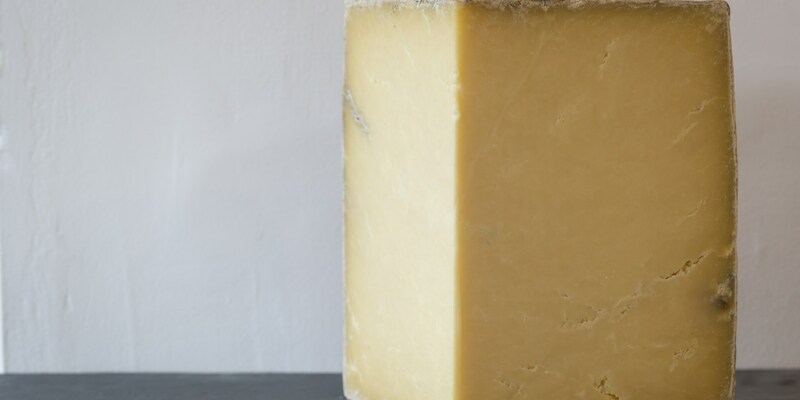 West Country Farmhouse Cheddar has a depth of flavour that the mass-made blocks can’t achieve. While industrial cheddars tend to be very sweet to appeal to as many people as possible, the traditional varieties are much more savoury, grassy, sharp and creamy. There’s the unmistakable ‘farmyard’ taste in many wedges, thanks to the unpasteurised milk and traditional maturing methods, whereas mass-made cheeses use pasteurised milk from all over the country, so there’s no nuances of flavour coming through. Of course, there are incredible cheddars that don’t come from the West Country and therefore don’t fall under the PDO protection. Isle of Mull Cheddar is famous throughout the UK for its incredible, powerful flavour, while Dale End Cheddar from north Yorkshire has a moreish tang and long, lingering aftertaste. While we’ll eagerly grate our way through a block of supermarket cheddar, these traditional handmade varieties are there to be savoured as part of a cheeseboard or as part of a very special ploughman’s. It’s certainly worth spending a little extra to experience hundreds of years of British cheesemaking.